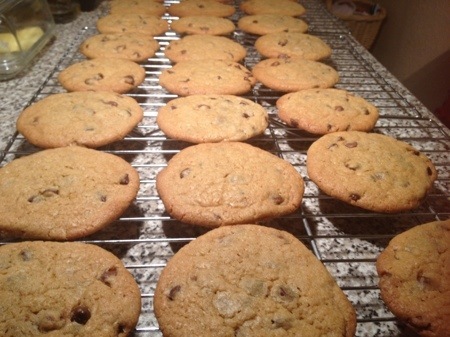 I am currently a little bit obsessed with the Chocolate Chip Cookies from M&S Bakery section. They put something addictive in them I swear! As a result I’m currently spending a lot of time trying to recreate that cookie. I don’t hold out much hope of actually doing that but in the meantime I’m baking a lot of decicious chocolate chip cookies! This one is my current favourite because of the melted butter. It’s ridiculously quick and easy to throw together and makes a delicious, chewy cookie with nice crispy edges just the way I like them! In order to get the full M&S experience you should eat the cookies warm… I challenge you not to scoff half the batch fresh out the oven, no one has that much will power! – Heat the oven to Gas mark 3/170C and prepare three baking trays. – Melt the butter, I put it in the microwave for 1 minute but microwaves vary so be careful! – In a large mixing bowl mix the melted butter with both sugars until smooth. – Beat in the vanilla, egg and egg yolk until smooth. – Sift in the flour, baking powder and salt and mix until it forms a dough. 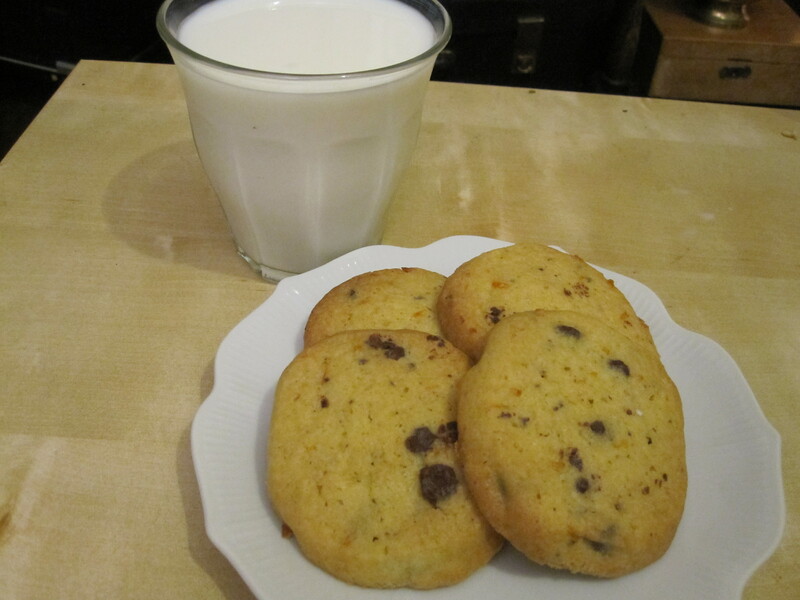 – Each cookie should be about a 1/4 cup size of dough. I use a dessert spoon to scoop and drop onto the baking trays. Make sure they cookies are well spaced apart as they spread. – Bake one sheet at a time in the top of the oven for about 15-17 minutes. 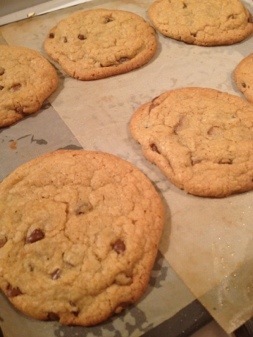 The cookies will still be soft but the edges should be a little brown. – Leave to cool on the tray for 5 minutes then transfer to a wire rack to cool completely/eat. – Repeat with the remaining trays of cookies. I had a plan. It was a good plan too. I was going to put a post up on Mondays and Fridays. Nice and easy, get a bit of organisation going on and keep my cooking mojo going. Life doesn’t seem to agree with me though. First I lost the recipe I was going to post, then I got the mother of all stinking colds and was out of action for a week. However, here I am ready to roll (although, admittedly snuggled up in bed as it’s miserable outside and I’m still a bit unwell). This recipe is an old favourite from childhood. The main selling point is basically, cookies on demand! You make the dough, bung it in the fridge (or freezer) and then when you want cookies you simply slice however many you want off the log and bake them. 15 minutes later you have cookies! What’s not to love about that? – Cream together the butter and the sugar. – Add the orange zest (I like to zest my orange over the bowl so that you get all the lovely orange oil too for really fragrant biscuits). – Beat in the egg. 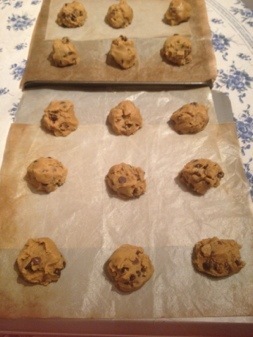 – Sift in the flour and baking powder and add the chocolate chips. – Mix until it forms a dough. – Shape the dough into two logs about 2″ thick. 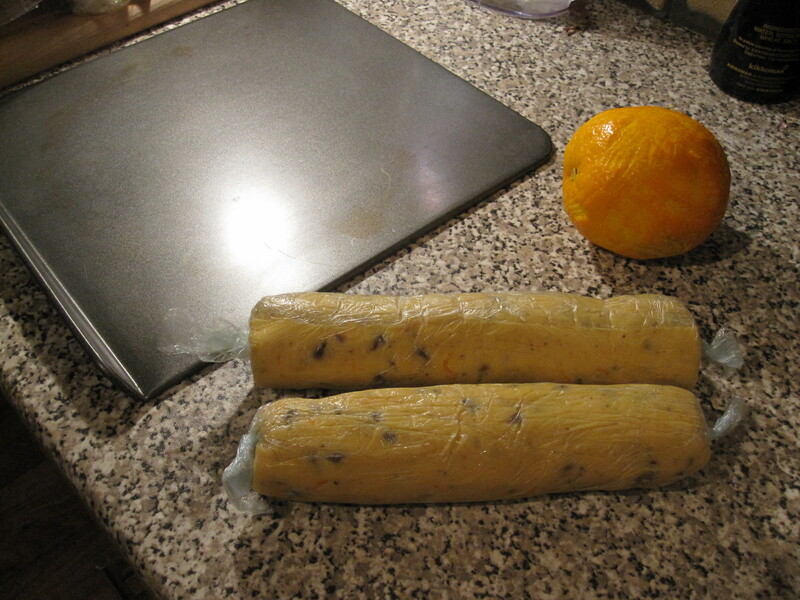 – Wrap in clingfilm and chill in the fridge for at least 2 hours or up to one week. -When ready to bake heat the oven to gas mark for and slice however many cookies you require from the log and place them on a baking tray.